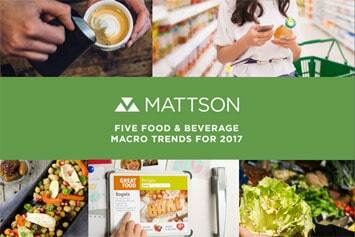 US food-beverage design and development firm, Mattson, develops concepts and formulates products across many channels within the food world, including food-away-from-home, FMCG, ingredients, and others. It’s president and chief innovation officer, Barb Stuckey, outlines the macro trends that will influence her company’s work this year. She writes: We believe it’s important to scan the horizon for the next hot superfood or ingredient. However, our ability to future-proof product innovation is more impacted by macro trends that will fundamentally impact how we engage with food. We gain insight into future trends by virtue of the fact that our work today will hit the market in the next 12-24 months. We are, literally, developing the future. We also engage regularly with consumers, during the testing of foods, food behaviours, and new food ideas. Our clients range from individual entrepreneurs to the largest food companies in the world. As a result, we’re entrenched in how food innovation trends will impact both. Our entrepreneurial clients tend to be the most bleeding-edge. This is where we’re starting to get pushback on traditional food formulation approaches. While we may think we’ve reached sensory perfection on the prototypes we’re developing, some clients want their products to be less than perfect. We know how to solve unpleasant textures and bitter “off” flavours. However, our Millennial clients are not dissatisfied with these so-called faults; in fact, they view them as badges of authenticity. As a result, we are now developing gritty almond milk beverages that separate after 20 minutes of stillness, when we know full well how to make creamy, smooth drinks that stay in suspension. We’re rethinking how to formulate queso dips. Our clients are okay with dull, lumpy visuals, when in the past we have created cheese sauces with silken shine. This evolution towards reformulation is in part based on consumers’ desires for ingredient statements that are as short as possible. Even ingredients as benign as natural flavour and cornstarch are seen as unnecessary and unwanted. Less is more. This trend also extends to our branding and design work, where we’re seeing more subtle matte substrates, a migration away from slick and glossy varnishes. Also, we’re increasingly seeing brands leveraging their short ingredient labels as primary imagery and graphics on their master packaging. The best case scenario is a list so short you can print the ingredients on the front of the package. The end result is that our perception and definition of perfect food is changing and the momentum towards a cleaner food ethos is being defined as wholesome and real. Only time will tell if consumers will accept these “imperfect” products, but indications are that the under-30 crowd will—and willingly. In 2016 I wrote a Forbes article about the semantic fight in the plant-based/vegan food space over what to call this new wave of non-dairy, non-meat food and beverages. We are firm believers that the term “plant-based” is where the industry will go. We cannot tell you the last time an entrepreneur came to us with dreams of selling their new product at Walmart, Kroger, or Safeway. Rather, they have visions of building their business in pretty much any other way than traditional retail. The proverbial grocery store shelves, cashiers, shopping carts, and slotting allowances (payment for shelf space) seem anachronistic to Millennials. From online shopping to subscription meal services to instantaneous real-time virtual purchases, Millennials are changing the meaning of retail. Thank you Prime, Instacart, Google Fresh, Blue Apron and Uber! The most interesting retail innovation to surface recently has been Amazon Go. 2017 is ushering us into a “Post Truth” era where people trust their gut and others’ opinions more than they do experts.